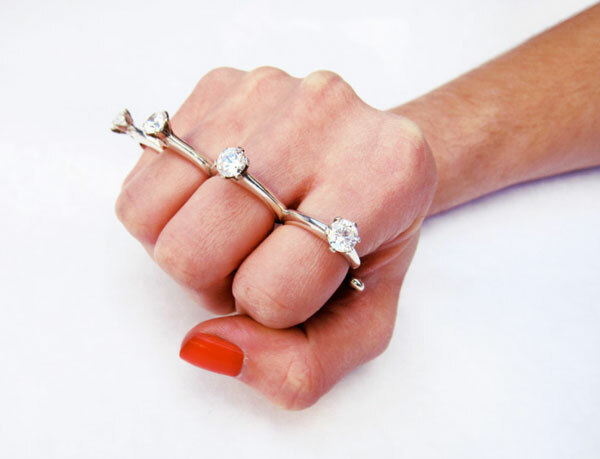 If you ever thought the female obsession with engagement rings went too far, then you probably will think that designer Kate Bauman could use a talking to. The 4-finger ring (or should I say “rings”) is made from sterling silver and cubic zirconium, and unlike your fingers, each of the hoops are the same size. So don’t expect them to fit. Or to look especially good. 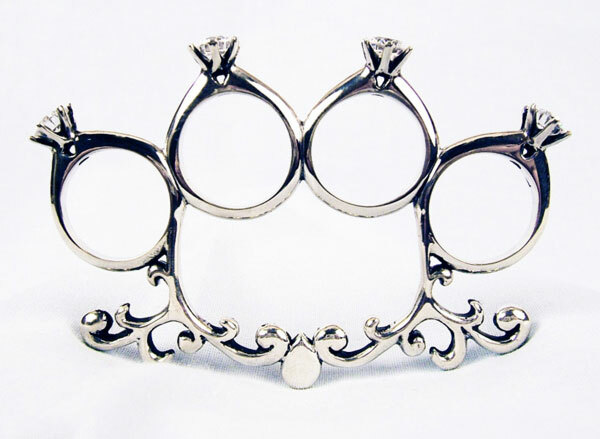 But they do have a certain little ghetto-brass-knuckle aesthetic that could probably BLEEP up a BLEEP in her face. And that’s what every classy girl wants. You too can have your own fist full of shut-yo-mouth in the neighborhood of $282. Not very well at all. I wouldn’t even consider it unless you’re open to replacing the ring down the road, possibly many times over. Are hydrogen powered cars a realistic green alternative to EVs? Beware of Aisle 9. Lost In a Supermarket are trained amateurs — do not try this at home. "Borrowing" images on the Interweb is so easy, but we do not recommend you do this for commercial gain. We don't.